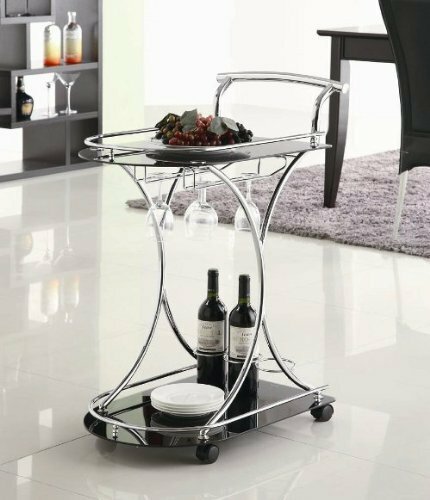 Versatile, mobile, and stylish, this serving cart checks many boxes when it comes to functionality and design. A steel frame finished with chrome accents holds this piece together. Contrasting its bright chrome coloring are two black glass shelves. Shelves with guardrails, a three-bottle wine rack, and a stemware rack bring the versatility and functionality to the piece, making it a great accent to your kitchen. Casters round out the construction for easy mobility and range of use.